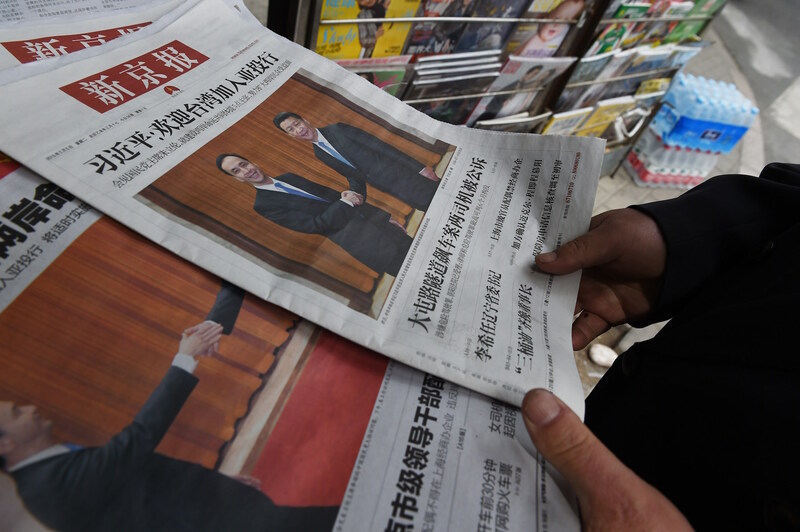 A Beijing newspaper featuring a front-page photo of Eric Chu (left), Chairman of Taiwan’s then-ruling Kuomintang party, meeting with Xi Jinping in Beijing, when the Chinese President warned against Taiwan being seen as a country, May 2015. President Trump agreed to honor the U.S. “one China” policy in his first phone call with President Xi Jinping since taking office, providing the basis for bilateral relations to move forward. Shortly after the February 9 call, Paul Haenle spoke with Evan Medeiros, former Senior Director for Asian Affairs on the U.S. National Security Council, to examine the significance of the call for U.S.-China relations. Medeiros said that Trump’s reaffirmation of the longstanding U.S. policy was a positive development for the bilateral relationship and for regional stability. Countries throughout the Asia-Pacific region, which are not interested in taking sides between the two powers or being drawn into a U.S.-China conflict, were relieved by the development. Medeiros noted that the U.S. “one China” policy and the Taiwan Relations Act leave ample room for the United States to enhance support and unofficial relations with Taiwan. Haenle argued that the “one China” policy serves the national interests of the United States, Taiwan, and the Asia-Pacific region, and is not something simply being dictated by Beijing.